(LIMITED SUPPLY LEFT - CALL PRIOR TO ORDERING, THANK YOU!) As you might suspect, a book with this title features many photos of barefoot kids happily stomping in the mud. 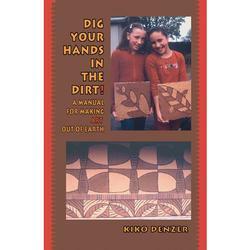 Mud huts and mud pies conjure up pictures of primitive peoples and childish pleasures. But then you realize that the kids aren't in Africa, but in Washington DC, Chicago, Portland (Oregon), and Berlin. And they aren't all kids! Looking past the pictures of giddy, muddy fun, here is substantial and serious inspiration and practical lessons for artists, teachers, students, and designers, as well as builders interested in natural materials like adobe (and, more recently, it's British counterpart, "cob.") A comprehensive technical section spells out the details of finding the right mud and mixing it in more ways than you can cook eggs. Photos, captions, and illustrations provide many explanatory examples. With illustrated examples from his own work, Kiko explains how to translate simple, natural (and easy to draw) patterns into sophisticated and complex designs that transform bland and anonymous modern buildings into real places to shelter real communities. Here in the dirt is a democratic material by which to make serious and beautiful art, and a democratic process for creative collaboration. Rather than "art for art's sake," Denzer aims at communal beauty, beyond the rarefied atmosphere of galleries and criticism. Art is, he says, "experience by which humans learn." Beauty is fundamental principle that connect us to the world we live in. "Finding and claiming beauty," writes Denzer, "is a fundamentally positive act that helps unite a fragmented world, and makes sense of harsh and confusing realities....Art helps join us, harmoniously, to a whole." Brief, elegant, wonderfully and generously illustrated with drawings and 32 pages of color photos, this is a book for teachers, parents, builders, artists, and kids of all ages. 8-1/2x7 128 pages.